Very near to Morimoto Napa sits Rotisserie and Wine, Tyler Florence’s (of the Food Network persuasion) restaurant with a Southern flair. I had never had Scrapple before (lovely cornmeal dough and meat scraps deep fried) and was glad to enjoy the appetizer. Since I am a tartare lover, I had to had the beef tartare and was not disappointed. With a flair for presentation it came with fried onion rings and capers on toast points. Delicious. Jamie had to try the biscuits with brussel sprouts (I was willing to try the biscuit portion- you know how I feel about b.s.!) and it looked yummy (he ate everything). The duck confit on a waffle was new for me and I wanted more, and the cauliflower roasted with mint was very tasty. Can’t say I’m a fan of collard greens; but I loved digging into the deviled eggs with oysters. A bit mustardy for my palate, but deviled eggs are very personal. I cannot say they were bad (I ate them all! ); but my personal preference is less mustard. Of course we had to try the red cake with cream cheese frosting for dessert (a nice finish), and the Dark and Stormy Float was incredible (Ginger beer ice cream float). Now, the rotisserie options are very limited (chicken, porchetta, lamb chops, beef ribs), and disappointingly they were out of the porchetta at 7:30 p.m. I saw a table that got the last portion and boy did it look great. So if you go and you love porchetta, I would pre-order it to ensure they’ll have it for you when you arrive. Even with the limited rotisserie, the largesse of sides to order surely makes up for it. Ambience is simple, and the tables are a bit small; but they paced out the food so that the table never got crowded. Whether planned that way or by accident, it worked! For 4 of us, with a $60 bottle of wine to share, the total was $221; so minus the wine, about $40 per person. Once an old hotel/inn, this property has been transformed into a lovely winery in the town of Calistoga. This is a small production winery that is a nice contrast against the large wineries found in the valley. With a tasting room surrounded by a very large pond (I’ll call it a mini-lake!) 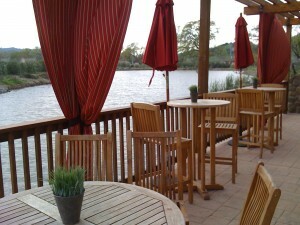 and outdoor seating around the lake with a large fountain, lots of fish and wildlife. But that is only the beginning. You are there to try their wines and quite a collection they have. Blend 23, Blend 24, Blend 26 (26 being my favorite) were 3 different Cabernet blends (with Syrah, Petite Syrah, and more) that both piqued curiosity about the nuances of winemaking, but also tantalized the palate with vast differences. From boldness in flavor, to softness in tannins, to exquisite fruity aromas- each wine we tasted offered something different. There was also Georges III, their nod to the pure flavors of Cabernet Sauvignon, as well as the To Kalon Cabernet (one of my favorites). They also have Sangiovese (yummy, yummy, yummy) and Syrah (a really lovely wine). They do provide food and wine pairing classes with advance reservations, as well as private group tastings back in the barrel room by candlelight. This is a lovely afternoon spot to enjoy for some really delicious red wine. Prices range from $34 to $75. And don’t forget to say hello to Gretchen and Laurie, the hospitality staff who are so helpful! Took me awhile to get it right, but I think I nailed it. Graham Cracker Bread with Roasted Marshmallows and a Chocolate-Maple syrup. I discovered that even though I put chunks of graham crackers into the bread, they dissolved- as did the baby marshmallows. The baby marshmallows added a hint of sweetness to the bread and left little pockets of caramelized sugar in the bread (I love it!). As for the maple syrup and chocolate, I found that milk chocolate maintained a better balance with maple syrup than did dark chocolate. When I used dark chocolate, it was all too “chocolate” for me. Next on the list: handcrafted marshmallows to finish out the recipe! Here’s a pic of what I’ve done so far. Elizabeth Spencer: Elizabeth and Spencer are producing really lovely wines. Yes, Jim and Jamie have been out wine tasting again. The air is cool, the sun is out, the blue skies beckon you to come and taste the harvest of the land. We have heard from so many guests about this place and we finally went to visit. 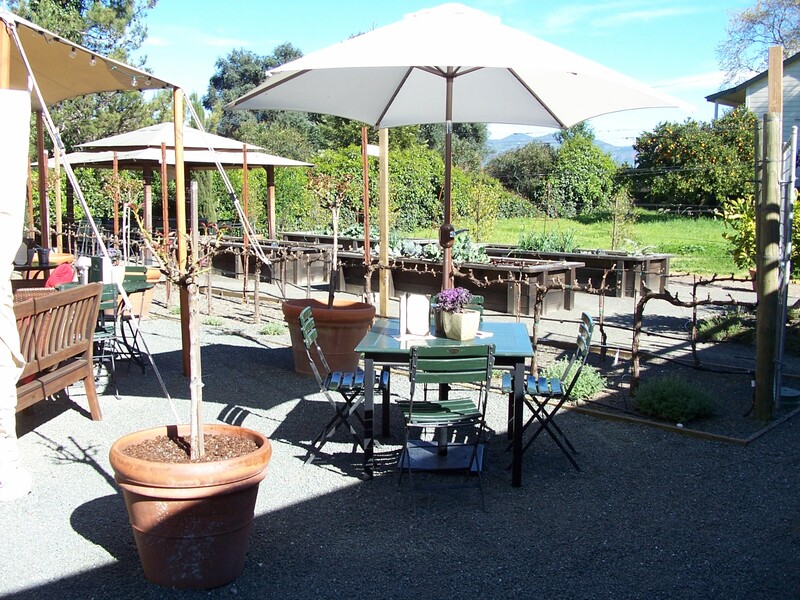 Located in Rutherford, it is a tiny tasting room with a lovely outdoor garden off to the side: either place is good for a tasting. For those who have visited Napa before you have probably driven by it and never noticed it. That is its appeal- small production, small winery, great wines. 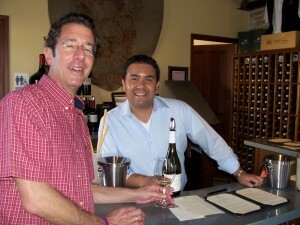 Hector was our pourer for the afternoon, and started us with a nice Chardonnay, block 7 from the Sonoma Coast. With over 25 wines produced, many with only 3 or 5 or barrels, you can imagine the breadth of tasting available. I counted 5 different Chardonnays, a Sauvignon Blanc, and a Chenin Blanc. And that is just the white wine. They also have many Pinot Noirs, a Grenache, at least 3 Syrahs, a Merlot, and 4 different Cabernet Sauvignons. Now they don’t pour all the wines each day, but what they do pour will give you a good sense of how they are playing with the flavors. One Chardonnay is crisp, another is creamy. One Cabernet is big on the nose, another bright with fruit on the palate, and still another smooth in the finish. What I loved was that they want to keep learning and growing and working with the fruit to extract different flavors, to provide different palates with something they can enjoy. They make no more than 10,000 cases in a year, and spread across 25 wines, that is small production indeed. Prices range from $18 to $75. Also, a shout out to Pamela, a neighbor of ours in Napa, who works at the winery! Free games for all ages will be conducted throughout the day. Enjoy live entertainment for the whole family. Lunch, snacks, beer and wine will be sold by local providers. The Napa Bike Coalition is offering Free Valet Bike Parking at the Northwest corner of Veterans Park (Main St. at 2nd near Downtown Joe’s on the grass). There will also be a 5/10k Fun Run & Walk along the Napa River Trail. See http://earthdaynapa.com/ for more details! Gargiulo Vineyards: small, hidden gem in Oakville. It begins with a drive in the Oakville District, looking for an address along the way. No big signs or lights or signals to guide you; simply an address. You drive up the driveway to the tasting room, open the door of the car, and realize what a lovely gem of a property Gargiulo is for anyone visiting Napa. In the tasting room, filled with the owner’s collection of guitars, you begin to understand their love of music and musicians. Long leather bench seats at a large wooden table, surrounded by windows that overlook the vineyards of the Napa Valley with gracious oak trees framing the view. The tasting room echoes the Gargiulo’s commitment to authentic expression and features reclaimed wood flooring from a 1950′s Napa gymnasium; chandeliers crafted from wine barrel staves and walls built from the property’s hallmark red rock. With a glass in hand, guests taste single vineyard, estate wines in the tasting room or on a sunny day, on the terrace overlooking all of Oakville. It is so beautiful here, in fact, that they had just finished filming a commercial for California Tourism on site the day before we visited. We tasted a full range of wines: a Rosato of Sangiovese, Merlot, a couple of Cabernets, and Cabernet blend, ranging in price from $45 to $125. Although the Rosato is drinkable now, generally these are wines for you to hold and cellar for long while; that will age gracefully and get better with time.